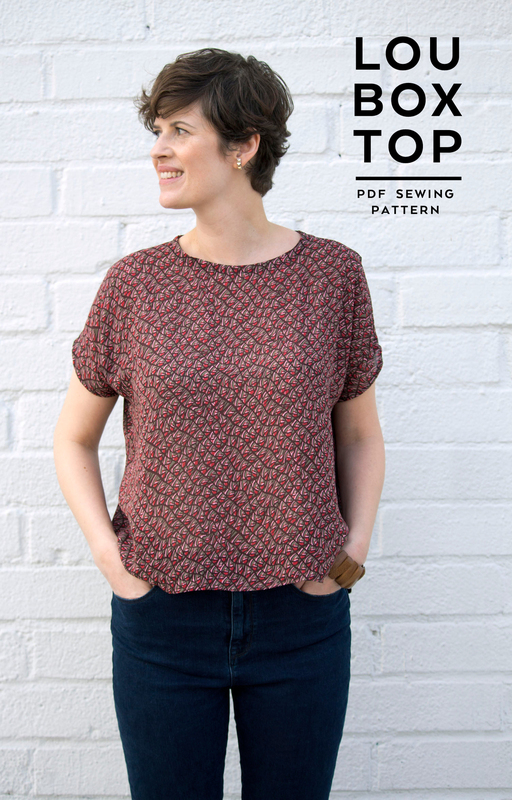 I'm very excited to announce that my first sewing pattern–the Lou Box Top–is now available for sale. The pattern is for a loose fitting top, in six styles. It's a great project for beginners looking to get their feet wet and for more experienced sewists who want to add some quick-to-make basics to their wardrobe. Designed with beginners in mind, the steps are very easy to follow, using the most basic techniques and the loose fit of the design doesn't require any fitting. The intention is that this pattern will be relatively frustration free and allow beginners to create clothes they love while also building sewing skills. The pattern is available as a pdf download including, a print-at-home pattern, copy shop pattern and illustrated instructions for both woven and knit fabrics. The pattern is very versatile with two neckline options and three hem options. Plus, the pattern pieces are designed to be Mix & Match so that you can easily cut out different styles without having to reprint the pattern. But wait there's more! :) You can use woven or knit fabrics making the options practically endless. I have made about a bajillion of these tops and I love wearing them. They are so easy to throw on with a pair of jeans and boots that I hardly have to think about getting dressed anymore. I tend to wear my knit tops when lounging around the house or going to the gym and the woven for work or hitting the town. My closet is full of them and I'm still scheming more of them (including some pattern hacks to share in the upcoming months!). Sound cool? Head on over to the shop and check it out! I'm going to be hosting a sew-along for the pattern next month that will give more detailed sewing tips and photos of the full process. Stayed tuned for more details on that! P.S. I want to give a big thank you to everyone that tested the pattern for me. I truly appreciate it. If you make one yourself and share on social media, make sure to use the hashtag #louboxtop and tag me. I'd love to see what you make!